David Letterman Honors Robin Williams With Moving Tribute on "The Late Show"
David Letterman gave a heartfelt tribute to Robin Williams Monday. "The Late Show" did not tape any new episodes in the days after the 63-year-old actor committed suicide, so Letterman assembled a touching 10-minute package that featured memorable clips from Williams' appearances on the program. The host also said he'd been friends with the "Birdcage" star for 38 years. "Many things come to mind in a situation like this, and of course, more questions are raised than can possibly be answered," Letterman said. He then recalled meeting Williams at The Comedy Store in L.A., saying, "In those days, we were working for free drinks--some were working for more free drinks than others. What you would do is you would go on stage, you would do your little skits, and you would come off stage. And if there was a new guy coming on, you'd want to stick around and make fun of the new guy, because we were all worried that somebody else was coming in who was really funny." From the get-go, Williams was a force of nature. "They introduced Robin Williams, and for some reason in the beginning he was introduced as being from Scotland. They said he was Scottish. So now we're stumped...All of a sudden he comes up on stage and you know what it is. It's like nothing we had ever seen before--nothing we had ever imagined before. We go home at night and are writing our little jokes about stuff, and this guy comes in and we're like morning dew--this guy's like a hurricane. And now, the longer he's on stage, the worse we feel about ourselves. Because it's not stopping!" Letterman recalled. "He finishes and I thought, 'Oh, that's it, they're gonna have to put an end to show business because what can happen after this?' We get to see this night after night after night and we didn't approach him because we were afraid of him. Honest to God, you thought, 'Holy cap, there goes my chance at show business because of this guy from Scotland!'" Not long after, Williams booked a role on "Happy Days". 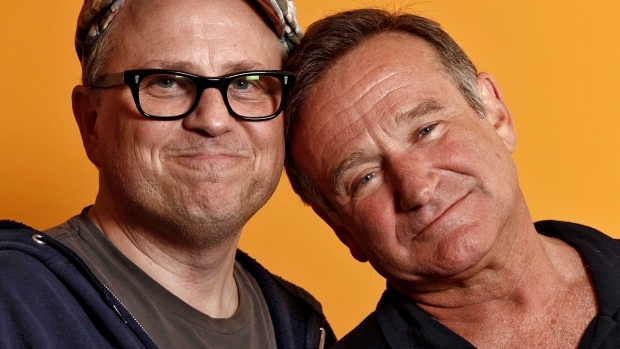 Williams was given a spinoff, "Mork &Mindy," and went on to become a major movie star. It wasn't until later that Letterman got to know the captivating comic. "He was always so gracious, and we would talk about the old times, and never did he act like, 'Oh, I knew you guys were scared because I was so good.' It was just pleasure to know the guy," Letterman, 67, recalled. "He was a gentleman and delightful." Letterman interviewed Williams more than 50 times. "People were drawn to him because of this electricity, this whatever it was that he radiated that propelled him and powered him," he recalled. The host then introduced Williams' highlight reel. "Beyond being a very talented man and a good friend and a gentleman, I am sorry I--like everybody else--had no idea that the man was in pain and that the man was suffering," he said. "What a guy."